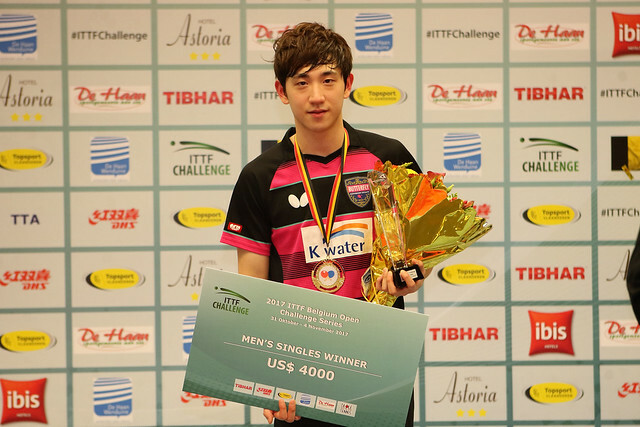 Romania’s Alexandru Manole, the host nation’s Thibaut Darcis and Frenchman Rémi Menand, the top three names on duty in the Under 21 Men’s Singles qualification event at the 2017 ITTF Challenge Belgium Open in De Haan, all experienced defeat on Tuesday 31st October. In each instance it was an encouraging start, fast forward, followed by a surprise reverse. After accounting for Israel’s Yonatan Shusterman (11-6, 12-10, 11-6), Alexandru Manole was beaten by Canada’s Antoine Bernadet (7-11, 11-7, 11-9, 9-11, 11-6). Likewise, it was the Pan American continent that caused Thibaut Darcis problems; he overcame Austria’s Narayan Kapolnek (5-11, 9-11, 11-9, 11-8, 11-9) but then suffered defeat at the hands of Puerto Rico’s Yomar Gonzalez (11-8, 11-8, 11-7). Meanwhile for Rémi Menand, the host nation’s 14 year old Adrien Rassenfosse who proved his nemesis. The man of the moment having also secured first place in his Men’s Singles group against the odds, Adrien Rassenfosse prevailed by the very narrowest of five games margins (11-4, 8-11, 11-3, 8-11, 15-13). In his opening engagement Rémi Menand had accounted for Egypt’s Abdelrahman Rahmou but he had came perilously close to defeat, he needed the full five games to ensure success (7-11, 11-3, 9-11, 11-8, 11-8). Successes and quite incredible successes; the surprise wins are all against players on the Under 21 Men’s Singles World Rankings over 200 places higher! Presently Alexandru Manole is at named at no.127, Antoine Bernadet at no.337; similarly Thibaut Darcis is at no.133, Yomar Gonzalez at no.346, whilst Rémi Menand stands at no.137, Adrien Rassenfosse at no.342. Surprise defeats for the leading names in the top three groups; lower down the order there were more and more pain for France, two defeats by the very narrowest of decisions. Lilian Bardet was beaten by Russia’s Ilya Berezin (11-13, 7-11, 11-8, 11-5, 12-10); Damien Llorca suffered at the hands of Konstantinos Angelakis of Greece (11-8, 5-11, 12-10, 14-16, 11-9). Defeats but there was a degree of respite for France; Nolan Givone upset the pecking order by beating England’s Luke Savill (11-6, 8-11, 11-8, 11-5). Meanwhile, to add to the list of prominent names who experienced problems, Moldova’s Andrei Putuntica was beaten by Italy’s Jordy Piccolin (11-6, 8-11, 9-11, 13-11, 11-9); the host nation’s Valentin Pieraert suffered against Israel’s Nathan Simon (11-9, 9-11, 11-5, 3-11, 12-10). Troubled times but the door is still ajar for those leading names who hit trouble. Players finishing in first and second positions in each of the 15 first stage groups, plus two “Lucky Losers” drawn at random from the third placed players, join the 32 seeds in the opening round.